I read this article and found it very interesting, thought it might be something for you. 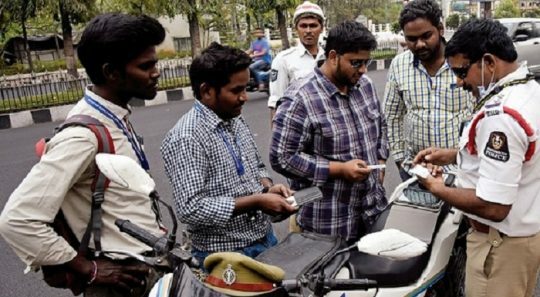 The article is called Driving to become more expensive in India: Motor Vehicle Act Amendment and is located at http://www.panasiabiz.com/9549/driving-become-expensive-india-motor-vehicle-act-amendment/. The 2016 amendment of The Motor Vehicle Act introduced by Nitin Gadkari in the Lok Sabha on Tuesday received massive opposition from MP’s because of reasons more than one. Firstly, a copy of the bill wasn’t given to all the members at least two days before the sitting, as is customary. This was defended by the minister saying that implementing this amendment is of paramount importance and any delay will result in the continuation of the increasing number of road accidents. This bill could reduce the number by 50 percent. However, the members responded by saying that the document is massive and can not be passed in a hurry (this session). Secondly, the bill proposes to increase the license fees by up to Rs. 1200. This increment is almost four times than that of the current fees. The cost of a learner’s license will be Rs. 150 per class, as opposed to the current Rs. 30. Additionally, the test will also cost Rs. 50. Renewing an existing license will cost Rs. 200 as opposed to the current Rs. 50. Thirdly, the international driving license seekers have also not been spared. Currently, an application for an international license costs Rs. 500 but, the bill proposes to increase it to Rs. 1000. The smart card format licenses will also cost twice as much (Rs. 400). Fourthly, there will be an expected increase of Rs. 300, as the bill allows states to charge for conducting tests. Fifthly, Currently the driving schools pay Rs. 2,500 for their teaching license, but the bill increases the amount to Rs. 10,000. The hike may be justified but, more stringent norms need to be applied at Regional Transport offices (RTO), mostly to reduce the “under the bench” activities that the department is so infamous for. The government outlets are known for corruption in issuing licenses across the country. This needs to be stopped on a large scale. There are unauthorised agents outside the RTOs who seem to dictate terms in the offices by means of their money and power. A concrete decision needs to be taken in this regard also. The bill is now said to be moved to the Rajya after it is approved by the Lok Sabha.